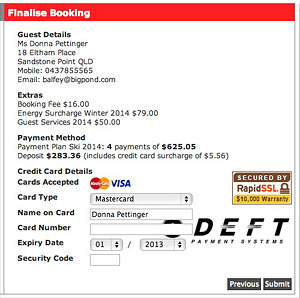 You can give your clients the unique opportunity to book and then pay for their accommodation ” by the month” with the genkan payment plan option at checkout. The Payment Plan allows your clients to make monthly payments between the time of booking until a time (specified under the plan) before arrival. genkan manages the payment process and there is functionality that allows you to schedule reminders for the monthly payments. A Payment Plan may be initiated at the time of booking at either the administration level or for the guest at checkout. genkan calculates the deposit required, the number of payments and the final payment date. The guests are sent a reminder every month to make their payment.